Have you ever taken a look around your house and decided it was way past due for some change? Been bogged down by everything so much that your home decor and overall image just kind of took a back seat? Yeah, me too. In fact, this has been me for a while now. As I mentioned in one of my Wearable Wednesday posts, I’ve been trying to spruce up my home little by little. In the past it has been hard for me/my family to really think very much about redoing our home and keeping up with the decor; simply due to being busy, as well as financial stuff . Sure I scroll through Pinterest and see all of the wonderful things I could be doing, but as well all know repinning, and actually doing are not the same thing. So I’ve been motivated to really turn our home into something that looks nice, brings us joy, and make it something we can take more pride in – and let others see it too. So naturally, I wanted to blog about it, and my journey in making our home fabulous again! Even though I have the motivation part down, I still faced the financial hurdle of where am I going to get the money to change things? I can’t afford to repaint my house, etc etc. A lot of people get an idea of redecorating and remodeling in their heads, and that it all has to be done right away, and be perfect; that you need to have all of the money for your project from start to finish before you begin. That’s totally not the case, and that is what I really wanted to talk to in my post today. Taking your home remodel on one step at a time. Taking more baby steps in remodeling was really want worked best for me, and my family. I tried not to worry about hoarding vast amounts of money to finish all my projects. I started with a welcome mat. 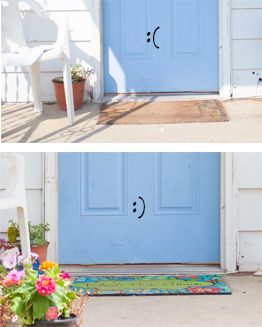 A welcome mat may seem like a very small thing to do and get, but believe me just by changing to a new and brighter welcome mat; we managed to bring a lot of zing and pep back in our porch. The colors and patterns were really nice for summer too! The best thing about it was, it only cost $12 at Walmart. That’s less than $15 and my porch already started looking better! My next step was to add even more color! I did this by buying some plants at Walmart, and Menard’s. 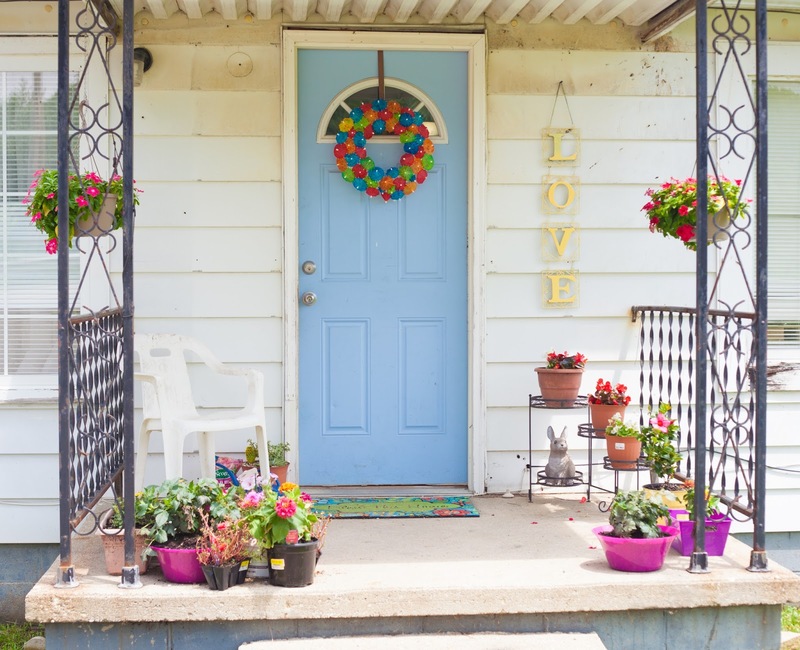 I think that next to changing your welcome mat, flowers and plants on your porch are one of the easiest ways to transform your space. Not only is it super easy, its also fun! I enjoy watering my plants in the evenings, and watching them grow and mature. I didn’t go out and buy all of these plants at once. No sir! To cut down my cost over time, I waited until some of the plants started getting cheaper, and shopped at the reduced plants section. Thanks to this kind of plant shopping, I got my pretty Vinca hanging baskets for only $4.88 each! That’s $9.76 total for beautiful hanging baskets to help fill and brighten the space. Then I added some Red and White Begonias to my porch bouquet. I also found these on sale for $1.98 a pallet, which was pretty darn cheap. I bought some succulents & cacti as well, because what porch is complete without succulents & cacti right? They’re so easy to take care of, and they always so classy. On my next trip I found some Dahlia bushes & other flowers on the reduced plant section. You’re making a huge mistake! 90% of the time, those flowers that were droopy and sad on the clearance rack will look brand new with a few days of care, and lots of water. One tip I have if you are picking out those beautiful discounted blooms, be sure to pick the one that has the most buds on it; not necessarily the one full flowers. 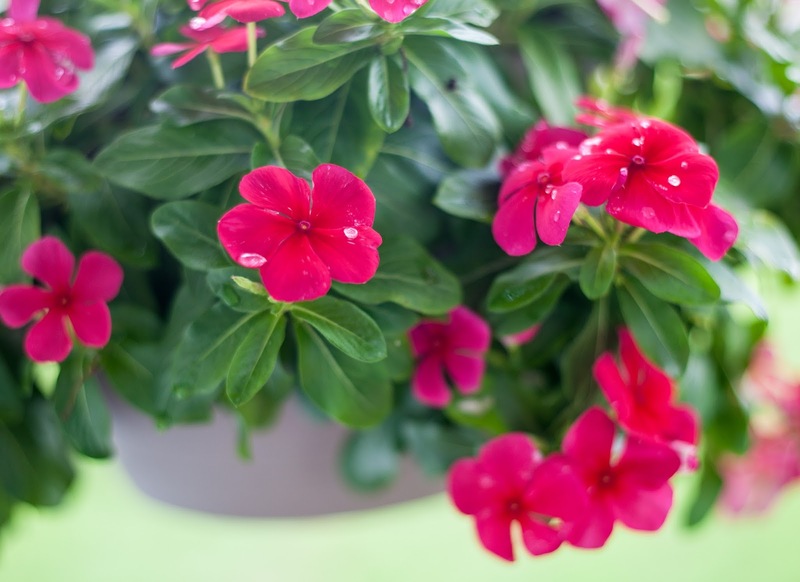 If the plant has lots of blooms/pods on it, that means you will have lots and lots of flowers when it gets nice and healthy, which is a prettier porch for you! Never judge a flower by its clearance rack appearance. Another thing I did to add a bit of color is look outside of the box in terms of planters. I bought a couple of chip/salad bowls for 88 cents and decided to use those for planters. They turned out really nice, colorful, and unique. I also recommend going to the Dollar Tree and seeing what kind of interesting containers they have. My Dollar Tree had lots of cool ones that could easily be made in to planters, just add holes at the bottom for the water to drain! Next on my list was finding something new for my actual door, as well as for the area beside the door. So I dusted off my Pinterest boards and went in digging for a door idea I could do really easily with almost no out of pocket cost. 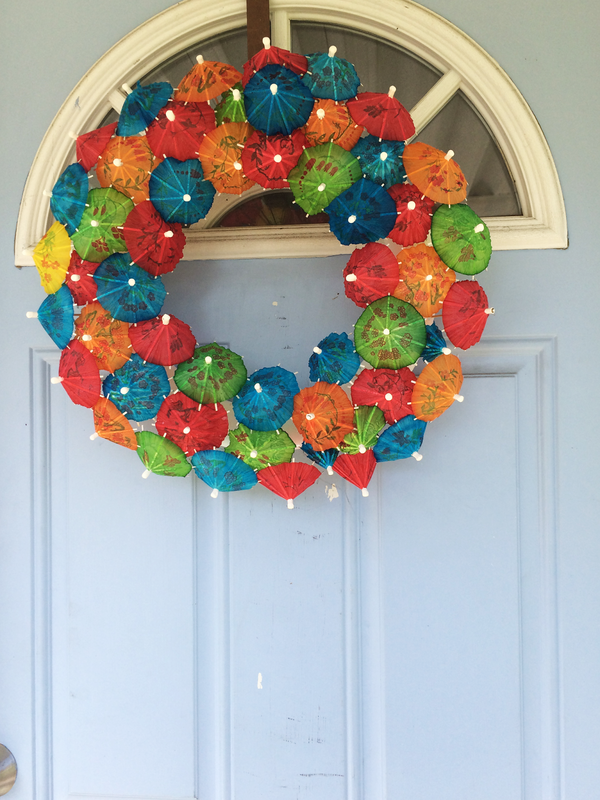 I hit the jackpot with this Paper Umbrella Wreath Tutorial. I had everything I needed already, minus a pretty ribbon (which I have yet to pick up. Oops.). The original tutorial calls for a grapevine wreath, but I took the super easy route and used a Styrofoam wreath. All of the umbrellas poked in the wreath easily, without me having to use any glue or anything! For the LOVE sign by my door I spray painted some black wood & metal art that I had taken down not long ago. I spray painted it a fun light yellow to go with the blue and other summer colors on my porch. This is what my porch looks like currently. Quite a difference, eh? 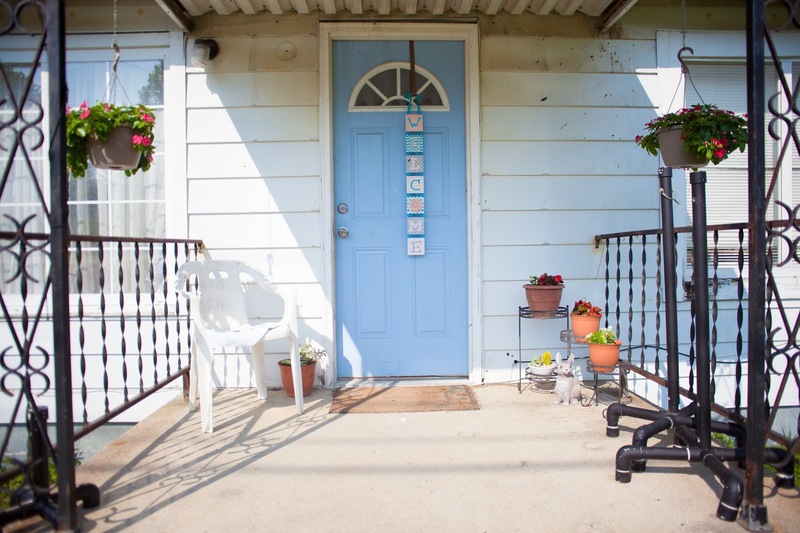 Sure it still needs power washed, and a lot of other things; but with the right amount of motivation and a little patience I managed to take some serious steps in transforming the look of my home, porch first! I hope this post inspired you all to look at your own homes a little differently, and help give u that motivation to remodel things in your home; one step a time of course! Make Your Wooden Spoons Pretty: A DIY! I also did like this when getting to clean my house with such a mess. Thanks for this post!